We've built up an amazing reputation for our super fast printing and delivery times, which we continually strive to maintain. You can choose to pick standard or express shipping options to suit your budget and time frame. Please live chat with our friendly team who are available to help 24/7. Alternatively, you can email us at hello@brightstarkids.sg and let us know the issue(s) you’re having, along with what type of computer or device and browser you're using to help with your enquiry. We’ll do our very best to get your issue sorted. To view your shopping cart please click on the orange shopping cart in the top right corner of the website. Once you have opened your shopping cart, you can easily edit or remove the item as well as updating the quantity but using the '-' and '+' symbols. How do I add a telephone number to my name labels? You can put your child's telephone number into the 'Extra Details' field. Simply tick the box underneath the text fields that reads 'Include extra details on your labels?'. Here you will be able to add a number or other text of your choosing up to 30 characters. Unfortunately you can only use one promotional code at a time. However any special offers that automatically get applied to your cart are usually allowed to be used along with other promotional codes. Can I send you a design for you to print? We can occasionally do custom prints, but this will depend on what it is that you would like to get printed. Please email hello@brightstarkids.com.au with all of the details so that we can assist you further. Am I able to exchange or return my item? Please refer to our returns & exchanges page for more information. Yes we can usually give discounts if you want to buy in bulk or if your order is over $200. Great for schools, hospitals or even for a large group of friends. Please get in touch with us with the details of your order and we'll do our best to help you. It's easy! Once you're logged into your account, simply visit the product that you'd like to review and underneath the product name, click on +Write a Review. To make sure your review gets published, try to make your review useful and informative. You can talk about the product, our customer service or anything else related to your order that you liked (or didn't like). You can leave your name or remain anonymous if you prefer. You'll receive 100 reward points once your review is published. Simply type in the emails of the friends you'd like to invite. Then press send. Your friends will receive an email with a special offer and a message from you. Don't worry, they won't be signed up our newsletter list so they won't get any further emails from us. When they make their first purchase using this voucher, you will get an email letting you know that the bonus points have been added to your account! Our Family Club pop-up window is a great guide for showing you how many points you need to redeem your next voucher. Once you have enough points, the button will come up with REDEEM. Click on this to automatically turn your points into a voucher. When you've redeemed a Voucher, click on the USE button. This will show you the unique voucher code that is available only for you for 1 use only. Click COPY and this will put the voucher code into your computer or device's memory. When you checkout, click Paste in the Voucher or Promo Code section and click APPLY. The voucher will automatically be deducted from your carts total. Yes, you can give your Voucher to your friend, but it only has 1 use, so you can't both use it. Can I use a Voucher and Promotional Code together? Yes, you can use 1 voucher and 1 promotional code together on the 1 transaction. When you apply the voucher, click apply and then add in the promotional code and click apply. You should see them get deducted from your total. How does the Newsletter Sign-up work? As you're already logged into your account, when you click the Newsletter Sign-up button, this will automatically add the email that is in your account to our weekly email subscription list. You can unsubscribe at any time. How do I earn points for reviewing products? Simply log into your account, and then find the product that you'd like to review. Leave a review, and then once it's published, you'll get points added to your account. Can I merge my accounts and rewards points? Unfortunately, we cannot merge your accounts and reward points. Yes, Stick On Labels will stay stuck to most containers in the dishwasher. We recommend following these steps to help them work correctly. Step One: Always clean the surface of the place where you want to stick the label to. (Any dirt, oil or grease may prevent the label from bonding properly). Step Two: Stick your labels to smooth surfaces that are clean and dry (free of oil, grease or dirt). Allow up to 24 hours before placing the container with the label into the dishwasher or steriliser. Step Three: To make your labels last for years in the dishwasher, we recommend that items should be placed on the top shelf and not go through the very hot temperature settings, e.g. pots & pans. 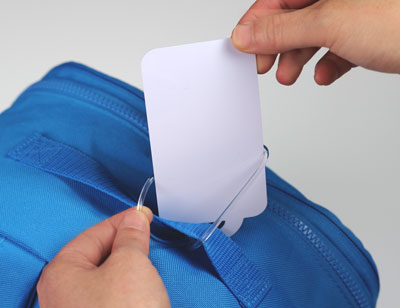 Stick On Labels can be easily stuck to most of your kid’s things, such as plastic bottles and containers. Being 100% waterproof they’re safe to use on most containers in dishwashers, sterilisers, microwaves and freezers. Surface Notes: Our labels have been thoroughly tested on various surface types without any adhesive issues, however we can not guarantee whether they will adhere to some textured surfaces. If you would like to receive a sample to try before you buy, please contact us. Why have I received blank labels in my kit? 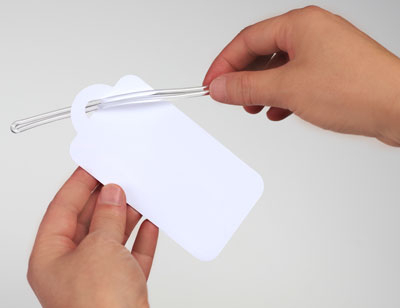 If you’ve ordered a Shoe Label kit or one of our Value Label Kits, you will have received blank labels. These are to go over the top of your coloured Funky Feet or Round Labels to give the print protection from wear and tear. They make the labels super durable and able to withstand even the sweatiest of feet! How do I apply Labels? Step One: For the Funky Feet Shoe Labels, stick the right foot shoe label on to the inside of your kids right shoe and the left foot into the left shoe (smooth surfaces work best). For the Round Shoe Labels, you simply stick each dot into each insole. Rub the labels down using good pressure. Step Two: Stick the clear shoe label over the name label (this will ensure that the writing doesn't wear off). What materials are the Stick On Labels made from? All our labels are produced on the best quality permanent vinyl that is printed with a durable ink, to make them withstand the toughest conditions. They're designed with rounded edges that make them stay stuck without peeling for years. How can I personalise them? Our Label Maker allows you to automatically see how your labels will look with the personalisation. You can make your labels as individual as your little one by choosing from a large range of colours, fonts and icons. Unfortunately, the font for the extra details is not able to be personalised. It has specifically been chosen for it’s legibility across all of our label sizes. You’re welcome to utilise the other name fields and choose from a great range of fonts instead. Will the printed label look exactly the same as the preview? Yes, the preview will be how it will be printed. Some slight variations in colour may occur as computer screens can vary. Are the Stick On Labels pre-cut? Yes. Every single label that leaves Bright Star Kids is individually cut so that it's easy for you to just peel off and stick to whatever you want. Can I get international characters printed? Yes we can print most characters, including Chinese and Greek. You should be able to preview your labels in International Characters before you buy. If you have any concerns or issues with this, please get in contact with us. Will the Shoe Labels stick in every kind of shoe? These shoe labels stick best to smooth surfaces, and once they’re on, they’ll be hard to get off. Extra clear labels come with each pair of Shoe Labels or Funky Feet to stick over the top. This gives your labels extra protection from wear and tear. How do I apply Iron On Clothing Labels? 1) Empty all water out of your iron to ensure NO STEAM is used. 2) Set the iron temperature to medium/hot for cotton fabrics. Lower temperature for delicate fabrics. 3) Peel off the Iron On Label and place it on top of the clothing with the name facing up. 4) Put the transfer paper sheet that comes with your kit on top of the label. 5) Use the flat section of the iron and AVOID using the steam holes. 6) Place the hot iron on top. DO NOT MOVE the iron and press firmly for approximately 10 seconds. 7) Carefully remove the iron and transfer paper. 8) Stretch the fabric to make sure the label has completely adhered to the fabric. If you notice any part of the label peeling up, repeat the above steps (a few seconds at a time). RESULT: The label should be completely merged with the fabric and will stay stuck through washing machines & clothes driers. The text is looking smudged or faded: This may be due to the iron being too hot and melting the label OR because the iron moving during application. Solution: Make sure to hold your iron 100% still, especially when you first put the iron over the label. If this doesn’t work, try turning the heat of the iron down and/or hold the iron over the label for a shorter time giving only short bursts of heat. Labels have come off in the wash: This may be due to the iron’s heat not penetrating through to activate the adhesion of the label. Solution: Make sure the iron is hot enough, that the piece of fabric isn’t too thick and that you’ve held the iron on for long enough. You can go over the same label numerous times as long as you use the transfer paper. But be careful as overheating the label may cause it to melt. Another suggestion is to apply the labels on a wooden chopping board, as it offers a solid surface to allow you to press more firmly on the iron. You will need to apply the heat for less time if you are using this method. Using the part of the iron that doesn't have any steam holes will allow more heat to be applied. What are the sheets of paper I got with my order used for? This is transfer (or baking) paper and it is to use when you iron the labels on to your clothing. If you run out or lose the treated paper, simply use good quality baking paper instead. As long as it’s got a good silky feel, this paper should work perfectly. We recommend using a good quality brand such as Glad or Multix. How will I know if my iron is at the correct temperature? The temperature and timing may differ depending on the type of fabric and make of iron, e.g. cottons will need a higher temperature with longer pressure and nylons will need a lower temperature with less pressure. We highly recommend that you test your clothing labels in an inconspicuous area before using all of your clothing labels. Can Clothing Labels be used in my washing machine and clothes dryer? Yes, as long as you've applied them correctly, they're so durable that they'll probably outlast the clothing itself. We recommend that you wait for at least 24 hours before putting the item into the washing machine or clothes dryer to allow the fabric to completely adhere to the clothing labels. They can be put through washing machines and tumble dryers without peeling off, even industrial style machines that are used in boarding schools and nursing homes. These clothing labels work best on fabrics that allow for irons, such as 100% cotton. We love to use them on school uniforms, hats, socks, underwear, towels and even some swimwear (although this last one can be a little tricky to get right). This is transfer paper and it is to use when you iron the labels on to your clothing. Please DO NOT use a substitute to the treated paper (such as a cloth), as there won't be enough heat to penetrate into the label and make it adhere. If you run out or lose the treated paper, simply use good quality baking paper instead. As long as it’s got a good silky feel, this paper should work perfectly. We recommend using a good quality Baking or parchment Paper brand. Are these Clothing Labels printed and pre-cut? Yes, we print all of our clothing labels with your details and all of Bright Star Kids Labels are individually cut so that it’s easy for you to just peel off and use. You can personalise & preview your clothing labels before you buy to make sure they look perfect. 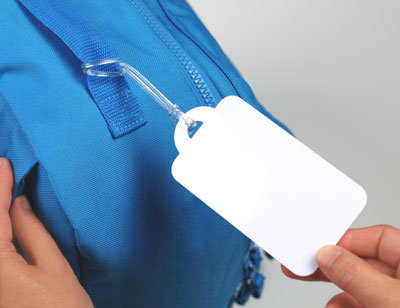 Do you have transparent Clothing Labels? Sorry this is not available for Clothing Labels. If you need to have no visible backing, the only way is to get them embroidered. Are Clothing Labels available in label value kits? Can I iron on top of the label when it's on the clothing? If you need to iron clothing that have iron on labels adhered to them, DO NOT put the iron directly on top of the label as the label may melt. Can I remove my Clothing Labels? Once you have ironed the clothing labels to the fabric properly, it will be very difficult to remove them as they are designed to be a permanent label. This means that they won't come off in washing machines and tumble driers. How do I attach my bag tag? 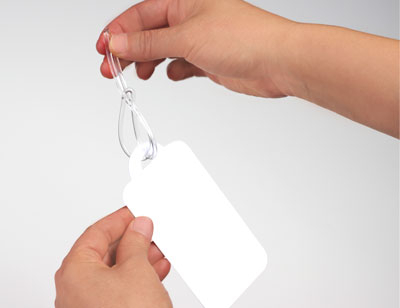 Bright Star Kids range of Bag Tags are easy to use. 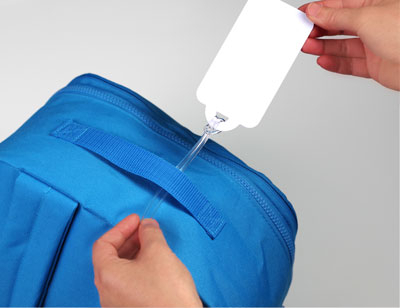 You can easily apply it to any school or sports bag, as well as luggage. 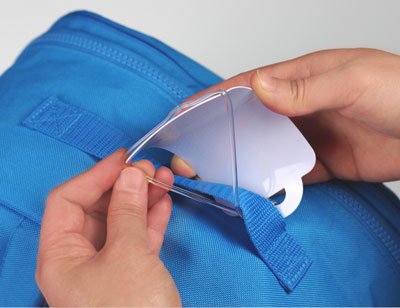 Step One: Push the plastic strap through the hole of the Bag Tag. Step Two: Pull one end of the strap through the other end. Step Three: Place the strap under the handle of the bag. Step Four: Bend the Bag Tag and push it through the plastic strap. Step Five: Pull the Bag Tag strap tight so that it's nice and secure. Step Six: Your Bag Tag is now ready to use. What surface can the Wall Stickers be used on? If your walls have recently been painted, we do recommend waiting up to 3 weeks for the paint to completely dry before adhering the Wall Stickers to help ensure they apply and stay smooth against the surface. Safety Notice: Wall Stickers are not a toy. Please always supervise young children when using this product. Some small parts may be a choking hazard. Always apply these wall stickers away from children's reach. Can I easily remove them without damaging the paint? Yes, they're completely removable and reusable, so if you want to change them around you can easily peel them off and reapply to a different area without any damage. Perfect for renters or kids who like to change their mind. How should I prepare my walls? You should ensure that your walls have been painted with at least 2 - 3 layers of good quality paint (ideally not the Wash & Wear variety). If your walls have recently been painted, we do recommend waiting up to 3 weeks for the paint to completely dry before adhering the Wall Stickers to help ensure they apply and stay smooth against the surface. Please Note: new houses tend to only have 1 layer of thin paint, so you'll need to paint with another 2 layers before you can use these wall stickers. Can I bring them to my new home? Yes, you can easily remove them and transfer them to a new room or home. This is one of the fantastic things about our removable Wall Stickers. Simply peel them off and stick them back on to your clean backing sheet that they originally came on. Then bring them to your new home and stick them back on the wall. If you have lost your original backing sheet you can place them on baking paper and transfer them on that instead. How can I clean my Wall Stickers? Simply use a dry cloth or duster to lightly wipe over the Wall Sticker to remove any visible dust. Do not rub hard with a damp cloth or use cleaning products on the printed part of the material as some colour fading may occur. Can I use a humidifier in the room? We DO NOT recommend using a humidifier with our range of Wall Stickers as damage may occur to the print or the humidity may make the wall stickers peel off the wall. Bright Star Kids are not liable for any damage that may occur. We're so sure that our quality Wall Stickers will stay stuck to all household surfaces that we'll give you 100% of your money back if they don't! Simple as that. Our one colour Wall Decals & Wall Letters are excluded from this guarantee, as this material isn't as flexible as the Wall Sticker material. If you'd like to try before you buy please get in touch for a free sample. How do I apply Wall Letters? Step One: At least 2-3 layers of quality paint. If you don’t have enough paint on your walls (as is the case in most newly built homes) you may find that the Wall Letters peel some paint off when you want to remove them. Step Two: Allow the paint to dry correctly for approx 2-4 weeks (longer for damp and/or cold rooms). If you don’t allow the walls to dry properly, you may find the Wall Letters peel off. Following these 2 steps will allow your Wall Letters to stay stuck properly and be easily removed in the future. Recommended Paint: We recommend avoiding wash & wear types of paint that are designed to repel dirt, as this can also cause vinyl to not adhere correctly. They come pre-spaced with transfer tape, which makes it quick and easy to apply to most smooth surfaces, ideal to use on painted plasterboard walls, smooth furniture or doors. You can watch the video tutorial above to see how easy it is to apply Wall Letters. The Wall Letter name or quote will be scaled down to fit in panels that are 30cm/20cm/15cm/10cm/5cm high. Wall Letters are made from a different material to our full colour Wall Stickers, and will only work on smooth surfaces, such as plasterboard, glass and furniture. We recommend avoiding wash & wear types of paint that are designed to repel dirt, as this can also cause vinyl to not adhere correctly. We also do not recommend placing the vinyl on cement or concrete walls, as the bumpy surface can cause the letters to not adhere smoothly. How do I make sure all my Wall Letters look the same size? Bright Star Kids will aim to make sure that all the names or words in each order will be similar in height, so no words will be smaller than others. This may mean that we need to scale down some names or words to make them work alongside the other names. Can I match my Wall Letters to previous orders? Yes we can print most characters, including Chinese and Greek. You should be able to preview your order in International Characters before you buy. If you have any concerns or issues with this, please get in contact with us. I want Wooden Wall Letters. Will these look the same? Our vinyl wall letters are NOT the same as wooden wall letters that generally come in varying depths. Vinyl Wall Letters look like they've been painted on and are a less expensive option that still looks amazing when applied to your wall. What material are Wall Letters made from? Wall Letters are made from a removable vinyl, which you can stick to most surfaces. This is a different material to the Wall Stickers range, so there will be a difference in finish and colour. Can I personalise my Wall Letters? Yes, they are custom made for you with your child's name or favourite quote created in your preferred font style, colour and size. Use our Wall Letter Maker to preview what your wall letters will look like before you buy. How will my child’s personalised clothing design be printed? Each order is printed on demand and directly to the garment so it blends perfectly with the fabric. For personalised clothing, we will ensure every name is scaled to fit perfectly on each design to suit your exact requirements. If you’d prefer to not have a child’s name on your order, simply write “Leave Blank” instead of a name and we’ll do just that. We guarantee that the finished piece is impeccable and looks extremely impressive. It makes a unique gift, perfect to give as a Christmas, newborn baby or birthday gift that every little one will love. To keep your clothing looking great we recommend that you wash them using a cold wash cycle. They shouldn’t be bleached or put into a clothes drier, but you can use a dry warm iron on the reverse of the print to keep them wrinkle free. We can print our super cute designs on to a range of baby onesies and kids tshirts, which includes onesies and bibs for babies and cotton t-shirts for older boys and girls. We also have a range of men's and women's t-shirt sizes available, perfect for special occasions. Please see any clothing product page for a complete size guide.